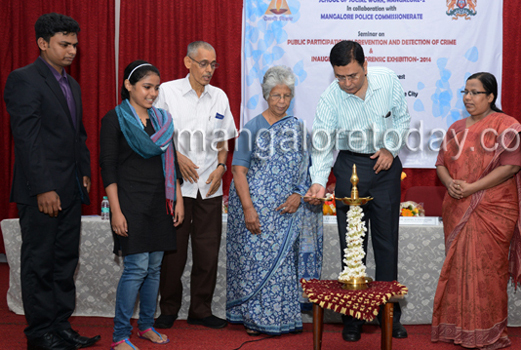 Mangalore, Sep 14, 2014: Inaugurating the seminar on public participation in prevention and detection of crime and a forensic exhibition- 2014, organised by department of criminology and forensic science of School of Social Work, Roshni Nilaya in Kankanady here on September 13, Mangalore City Police Commissioner R Hithendra stressed the fact that public can be proactive in prevention and detection of crime by good interaction with police authorities. No section of the public is entirely on positive or negative side and all can play a role in law enforcement and support. The need exists to be alert and observant. In the absence of public pro-action, police be efficient. Public can participate in prevention and detection of crime in several roles - as complainants, witnesses and be ready to stand by with information if necessary,” Mr Hitendra said. In the absence of evidence including finger prints to trace the culprits, DNA traces from the crime scene can be a help. Advanced technology would play a big role in future, the Commissioner said. Meanwhile, he gave two examples where new technologies helped in detection of crime : A. In illegal mining police traced culprits using satellite pictures of mine pits. B . A murder, where police nabbed the culprit based on the distance from which a bullet fired based on the penetration of the same within the body of the victim. 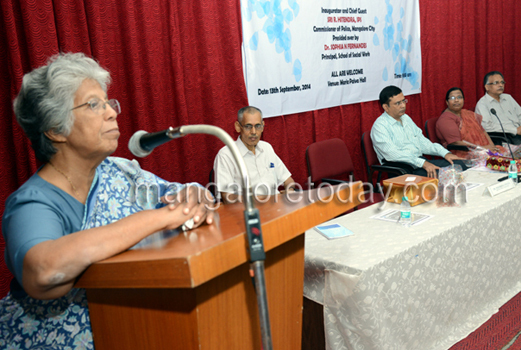 Roshni Nilaya School of Social Work Director Dr Philomena D’Souza said that society has a role in forming criminals. Ordinary public have to join hands with police to nip criminal tendency in bud, she said. 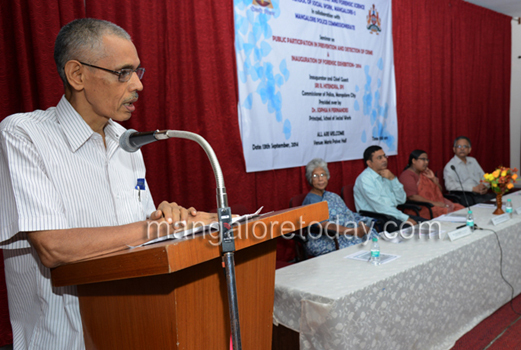 Principal, Dr Sophia N Fernandes stressed on educating public in safety and security norms to prevent crime and violence. Proper child care also reduces crime in the later years. Education system with mentoring teachers can play major role in preventing crime, she said. preserving evidence : Forensic Scientist Dr Deepak Raj Rao said one should never disturb the evidences like blood, vomit, cloth, cigarette pieces, bottles or any other material from the place of crime out of curiosity. Don’t smoke in the place, spit, touch the door handles or use mobile phone which might be at the scene of crime. The spot must be cordoned off from any disturbance. In case of cyber crime, he suggested not to switch off or on the computer before making over the system to the custody of police. It is better to preserve a digital picture of the window and inform police. If unwanted pictures are uploaded, inform police before deleting. Police would have to record the picture and deleting would thwart investigations. 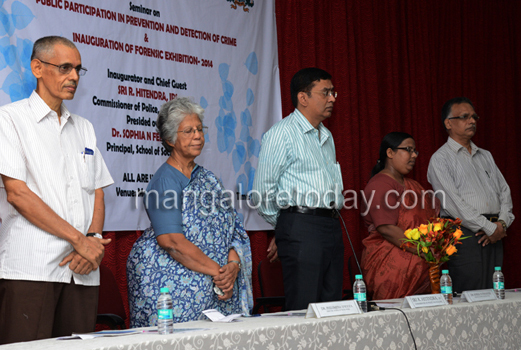 Roshini Nilaya Registrar Dr Laxminarayana Bhat P, Criminology and Forensic Science Department Head B Ashoka were present among others. Department of Criminology and Forensic Science of Roshni Nilaya had also created a crime scene as part of the exhibition. There was ‘body’ on the floor under the fan with signs of blood. There was a rope around the neck, however it looked like someone stabbed ‘him’. The students brilliantly explained how the culprits murdered the ‘person’ and tried to dress it as a suicide. The love letter and purse belonged to victim, alcohol bottles and other evidences helped to nab the culprits, they said. It was just one example. They explained how, through the shape of glass pieces one can identify the angle of the bullet. There were forensic ballistics, different types of firearms. Various points in identifying guns and gun handlers were depicted. 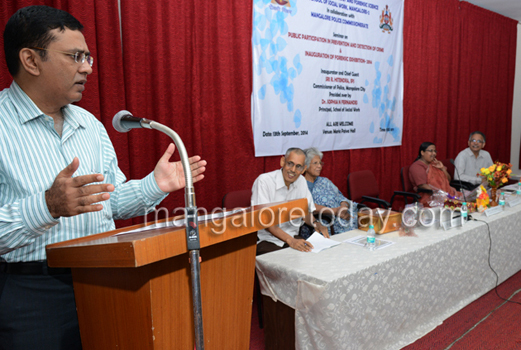 Cyber crimes and information on the methods of identifying code writings, collecting foot prints and fingerprints, characteristics of fingerprints, forensic photography, serology (identification of blood strains etc), hair analysis, forensic entomology (stages of decomposition of body) and forensic anthropology (study of bones) was explained using charts. Many people visited and found the methods interesting and educative.